Praziquantel (PZQ) is the main treatment of Schistosomiasis mansoni. However, resistance to it was described. So, there is a necessity to develop novel drugs or to enhance the present drugs. 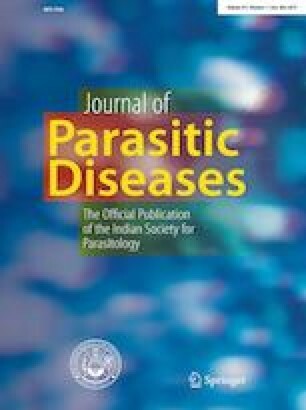 This work aimed to assess the efficacy of PZQ alone and when loaded on liposomes in treatment of S. mansoni infection by parasitological and histopathological studies in experimental murine models. 112 male laboratories bred Swiss Albino mice were used in this work. They were divided into four groups: Group 1: control group; Group 2: infected then treated by PZQ (500 mg/kg) at 7, 30 and 45 days post infection; Group 3: infected then treated by liposome encapsulated PZQ (lip.PZQ) (500 mg/kg) at 7, 30 and 45 days post infection; Group 4: infected then treated by free liposomes at 7, 30 and 45 days post infection. The results showed that G3 caused the highest significant reduction of the total worm count, eggs/gram liver tissue and intestine (97.2%, 99.3%, 99.5%) respectively. Followed by G2 (85.1%, 97.6%, 89.8%) respectively. Regarding the histopathological studies, G3 showed the highest significant reduction in number and diameter of hepatic granuloma (97.6% and 98.1%), followed by G2 (77.2% and 75%) when compared to other groups. In conclusion, lip.PZQ is more effective than free PZQ from all aspects especially when administered 45 days PI. AEMLEG and FAM shared in the study design and research topics. SAA-R shared in the study design, in performing the laboratory work, wrote and reviewing the manuscript. TIAS shared in performing the laboratory work of this study. GMF, SMM, and NAM shared in the laboratory work, collecting references wrote and reviewed the manuscript and MAE-S shared in the laboratory work and interperation of the results.